I had planned to meet up with a friend and hire bikes for the day, but just as I was about to leave I looked out the window and noticed it was raining steadily. The forecast suggested it would get worse, so we decided to wait for an hour or so and reassess. The forecast proved accurate, but by 11.15 I was starting to get cabin fever, and developing an urgent need for drinkable coffee, so I put on my raincoat and set off on an adventure in spite of the rain. Stupidly I didn’t take the waterproof camera, so the photos on this post are limited to times and places where it was not too wet to expose my phone. 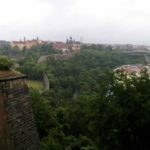 Instead of walking down and along the river, I headed uphill to explore the Vysehrad or translated into English: “upper castle”. This is a fort on the edge of the river, built around the 10th century. Yesterday we walked through a road tunnel that is part of the defenses. 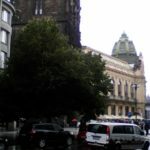 The first site I checked out was the Rotunda of St Martin, which is Prague’s oldest surviving building. St Martin is famous for tearing his cloak in half so that he could share it with a freezing beggar. If you look carefully at my photo, you can see two dark shapes to the right of the top window. The round one level with the top of the window frame is a cannon ball which has been embedded in the stone since the 1500s. 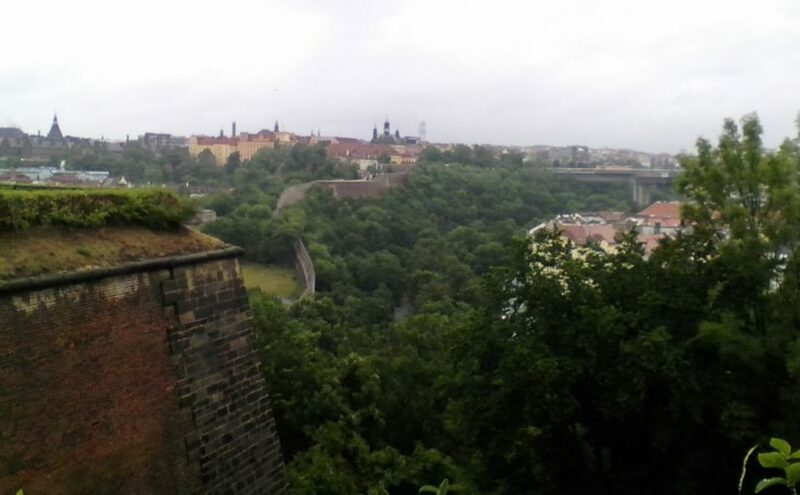 The next photo is the back of the fort, showing the wall at the edge of the Botic river far below, which flows into the Vltava just north of the complex. There were lots of footpaths disappearing into brick-lined tunnels through the ridges, so I spent quite a while walking happily in circles. At the top of the hill is the Basilica of St Peter and St Paul, which as usual had a hefty admittance fee so I only looked briefly through the doors. 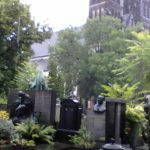 It is surrounded by a huge cemetery, where several notable Czechs are buried. As I was visiting right on midday, I was treated to a five minute concert of bell ringing. At least I hope it was a group of talented bell-ringers, and not someone on a modern keyboard with a big amplifier! I continued into town, getting wetter and wetter as the rain persisted down. I did stop off for a coffee at a hip little cafe, but alas, it was a bit too hip and the woman ruined it by putting soy milk in my flat white in the hope of saving the planet. The caffeine revived me though, so I continued into the Old Town, and wandered randomly down small streets and alleys looking out for somewhere to buy lunch. I ended up in a different part of the Jewish Quarter from where we were yesterday, and stumbled upon the Jubilee Synagogue, also known as the Jerusalem Synagogue because it is in Jerusalem Street. Again I declined to pay the entry fee, and just enjoyed the exotic facade. It is actually quite a modern building, built at the beginning of the 20th Century. 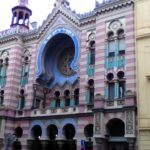 The architectural style is Moorish Revival, which seems rather an odd choice for a Jewish building. By now I was getting pretty hungry, but reluctant to eat yet another meal based on sausage. I was also extremely wet and somewhat cold, so my enjoyment level was getting dangerously near zero. I must have passed hundreds of shops selling round tubes of sweet bread sprinkled with sugar and stuffed with cream – they look much better than they taste and I doubt if many people eat them regularly. I was starting to think I might have to settle for a slice of pizza when I found one of the Bageterie Boulevard shops that I had seen advertised everywhere on posters throughout the city. This chain is a kind of up-market Subway that bakes proper baguettes and stuffs them with interesting fillings – if they ever come to NZ I would be a regular customer. With morale restored I set off again, and found another cafe where the coffee was at least drinkable, although still not in the same class as the barista near the river that we visited yesterday, who I would patronise regularly if I was a local. Considering the relatively high profit margin on coffee, it is surprising how few people here know how to make it properly. The last photo is the Powder Tower, which is one of 13 original city gates. 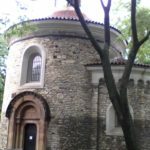 It was built in 1475 by Vladislav II, and was used to store gunpowder in the 17th Century. By now the gutters were deep puddles due to overloaded drains, so passing vehicles were wetting me from below in addition to the rain falling from above. It was varying from steady to heavy to torrential so I decided I had had enough exercise for the day and jumped on a tram back towards the hotel. we enjoyed your adventures but we missed the lack of captions under the images , but please don’t let that discourage you .